Starting seeds in small containers is wonderful, but there comes a time when they need a little breathing room. When the time comes, head for your local discount store. 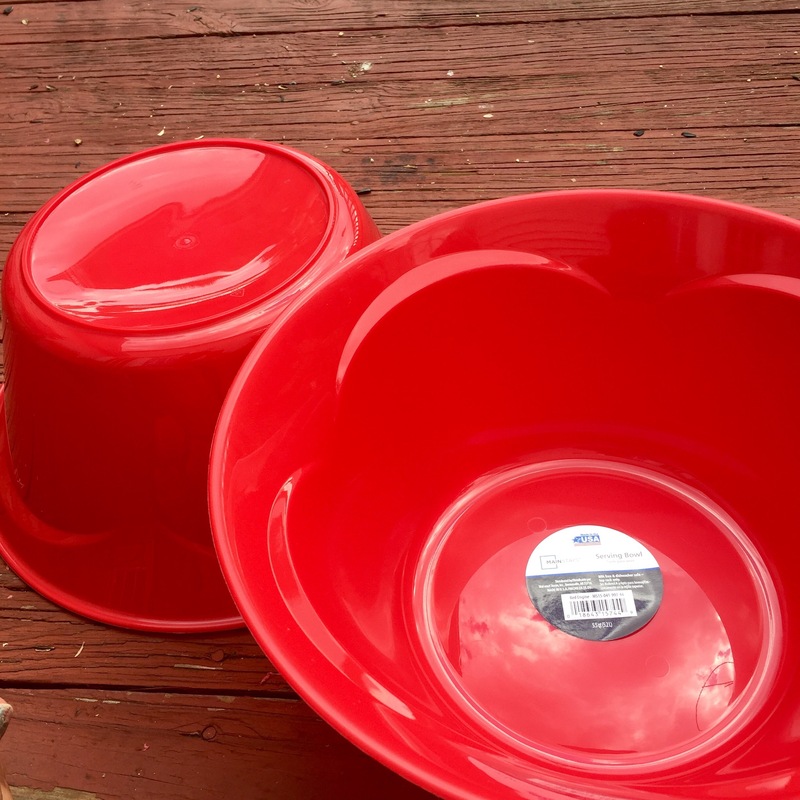 I found some great Fourth of July partyware on clearance. By now, you should know that pots aren’t really my thing. They get pricy and there’s really no excuse for it. 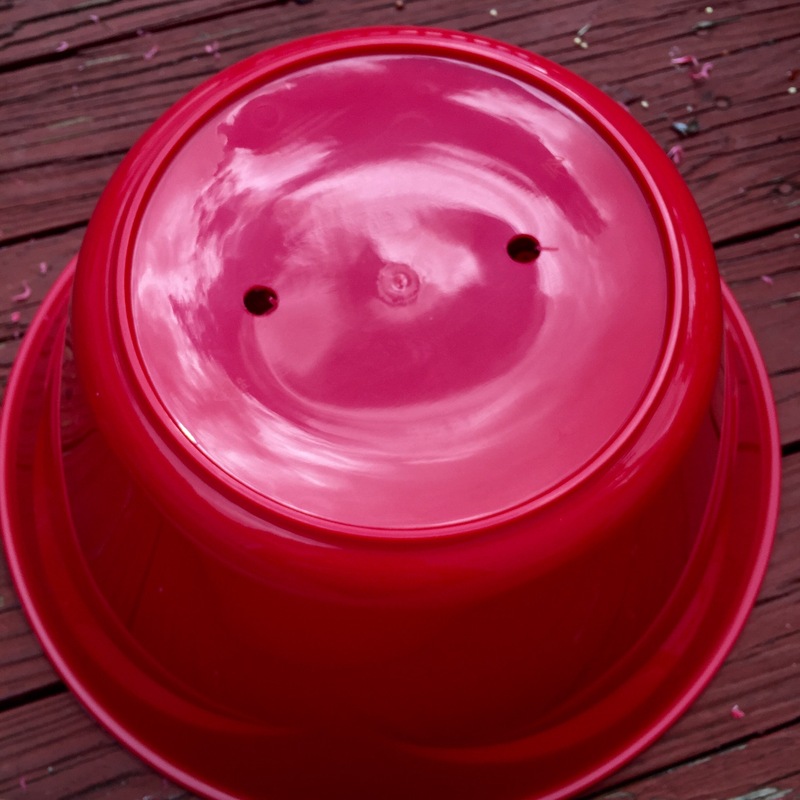 Plastic containers and plastic pots are made pretty much the same way, but for some reason pots cost ten times more. 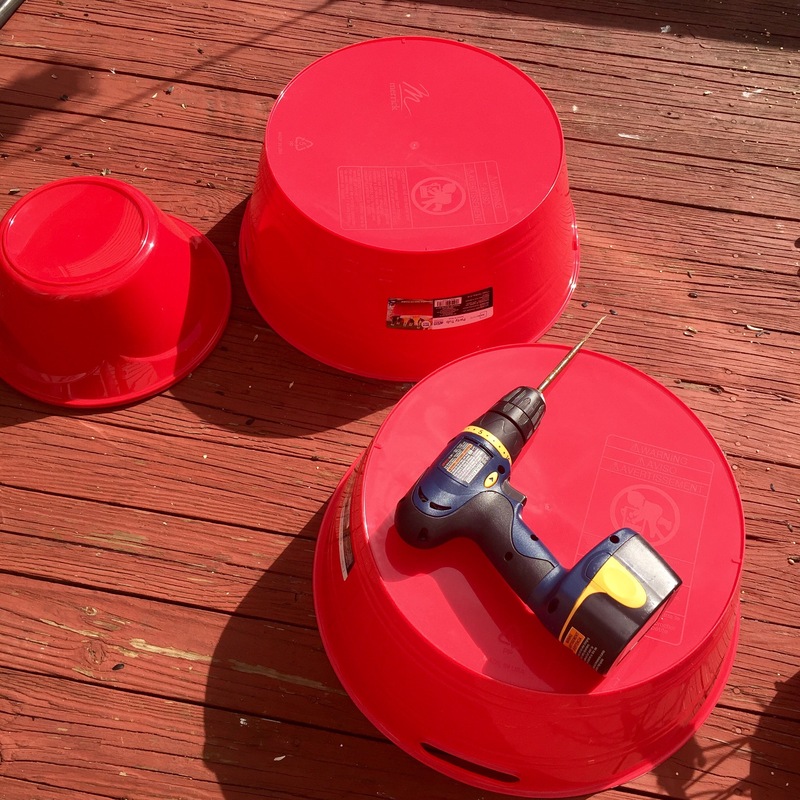 Like my earlier post, Container Garden DIY, I begin with drilling holes since partyware doesn’t come with them pre-drilled. Now, be careful here. 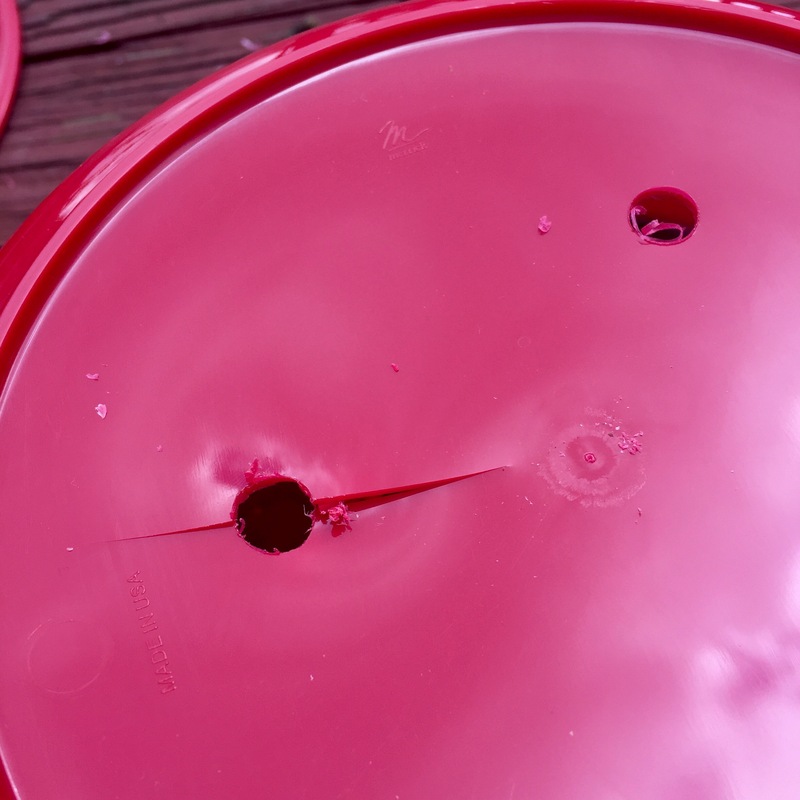 Going too fast or pressing too hard with the drill can crack the bowl. Even as many times as I’ve done this, I still screw it up. Easy pressure and let the bit work for you. Now, we begin the fun part. Dirt!! Actually, potting soil and pool noodle donuts. 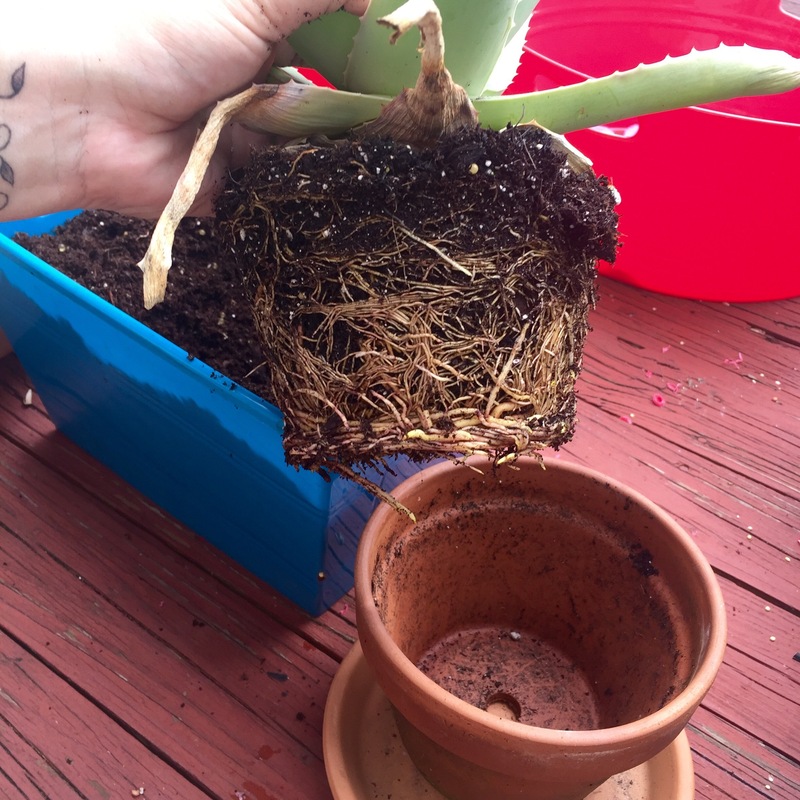 Potting soil is important to container gardening success. Garden soil is too dense and heavy for container plants to root well and drain properly. 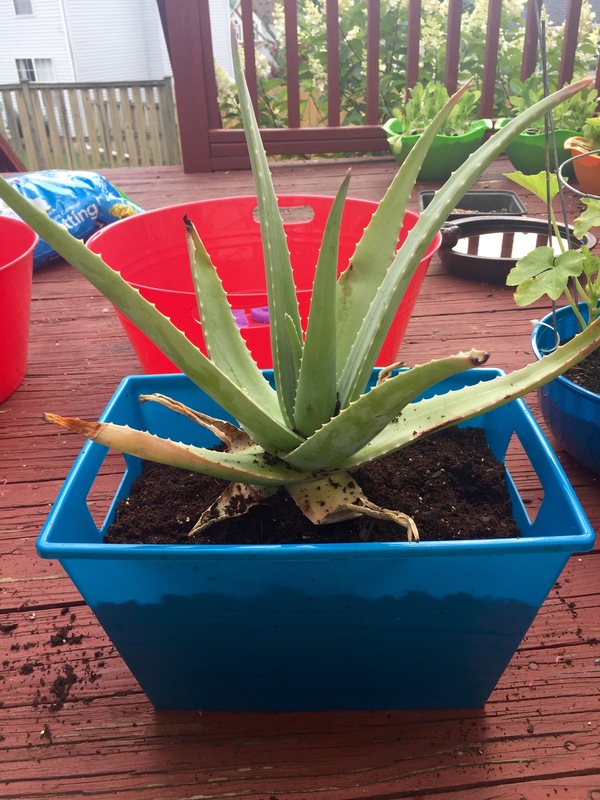 My aloe plant was bought for me because I tend to burn myself when I cook. I blame it on being 5 feet tall and too close to the stove and pots. My family says I’m a kitchen clutz. The plant was in a kitchen window, but just wasn’t thriving so I moved it outside. It began to do better, but was clearly root bound. Time to help the little guy out. After prepping his new digs, I loosened up his roots. While it seems cruel and like you are hurting the plant, it will thank you for it. Don’t worry if some roots break. Plants are awesome at overcoming that. 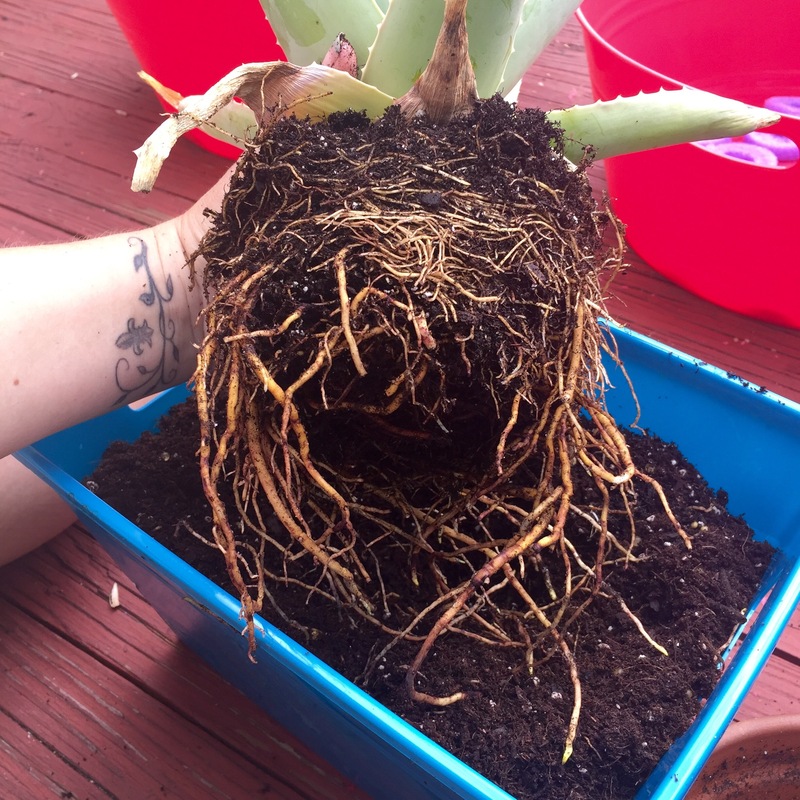 Nestle those newly freed roots into some potting soil and water it well to let the roots settle in to their new place. The other seedlings are far from root bound, but need space so they can grow into the big beautiful plants they are meant to be. After deciding who was going to live where (spinach in the large ones, eggplants in the blue, jalapeños in the small red), it was time to get transplanting. Yep, that’s how I roll. Plopped down on my deck in the dirt and bird seed shells. Glamour gardening. It gets the job done, though. I do have a small issue. 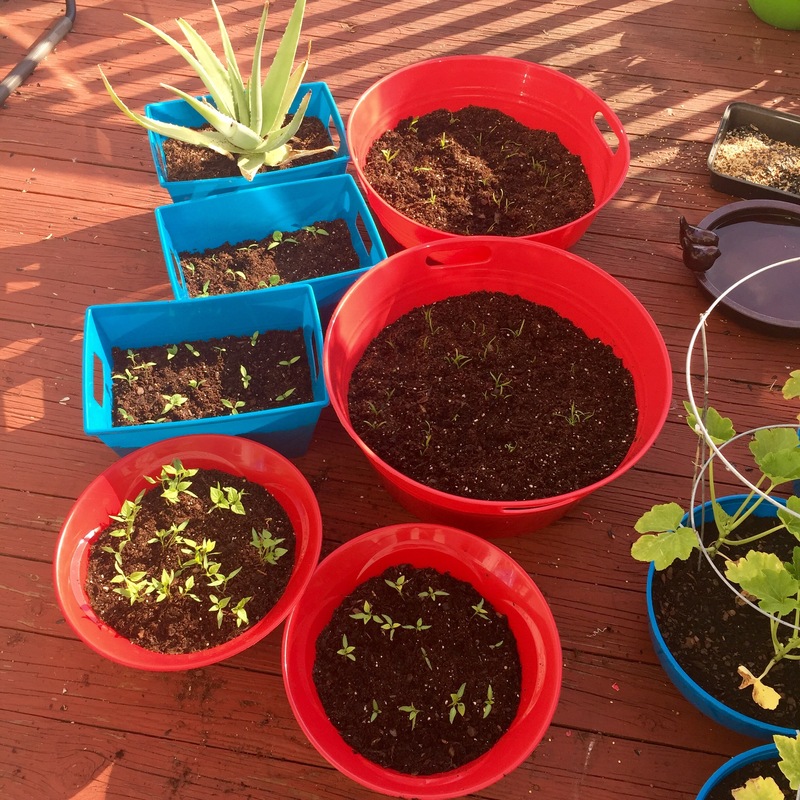 My container vegetable garden addiction is taking up some of my space for my yoga on the deck obsession. Making it work. The doves and squirrels had to come by and check out my handiwork when I was finished. Joe the cardinal had his dinner while I was replanting peppers. He’s too chill. Love him. Hope this little how-to will help someone. 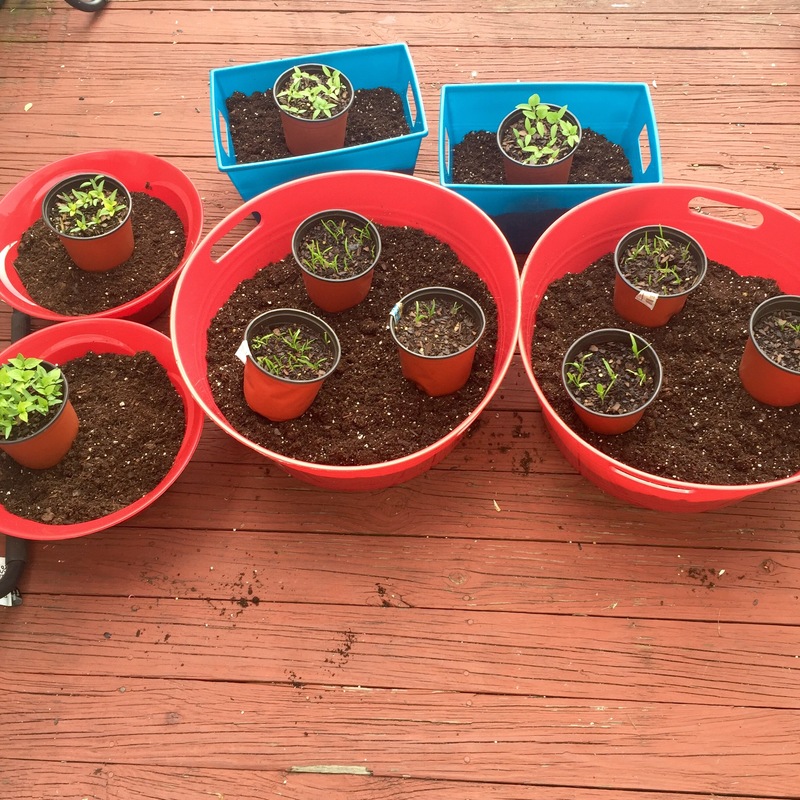 Share your container garden successes or questions in the comments! You have worked hard and nurtured your little squash plants. Mother Nature herself could not have done a better job. 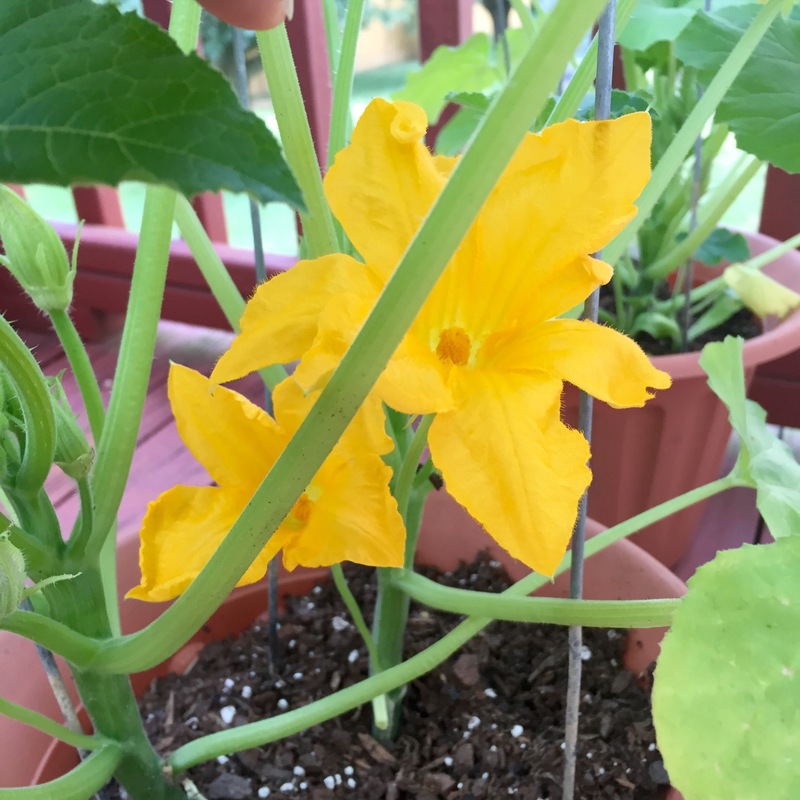 One morning, you check on your precious plants and find some big beautiful squash blossoms! Horray! You start planning your menu for when your prized squash will be ready for harvest. The next day, you go outside to discover the flowers have shriveled and gone all sticky. Egads! Some squash blossoms fell off the plant! What the heck? This spells disaster for your carefully planned menu and you begin to wonder where you failed your little plants. Never fear. This is completely normal for all squash plants, container garden or in the ground. Those big showy blossoms are indeed short lived and don’t have long for pollinators to find them. But there’s more to the story. You see, Mother Nature is clever. She puts both male and female flowers on the same plant. Only the female flowers will become squash. These little gems tend to emerge a bit later than the males and are usually closer to the center of the plant. Why? Because as the squash develops, there are more leaves in the canopy to shield it from sunburn and other dangers. Male flowers tend to be greater in number and often more on the outside of the plant. This makes the plant irresistible to pollinators. When our little friends buzz from male to female, they pollinate and a squash is born. Male flowers have some quirks. One, they are disposable. Meaning once they have bloomed and attracted bees, they aren’t needed and fall off to make room for others. So the squash blossoms falling off of your plant are completely normal. They are just males that are no longer needed. Others have likely bloomed in their place with fresh pollen. Two, they are delicious. Yes, you can eat them. Pull a few off and fry them or stuff them. But, wait, how do you know the difference between male and female squash blossoms? You don’t want to harvest one that has potential to be a veggie (fruit really. A berry to be specific.). Let’s talk anatomy. On the left is a male squash flower. 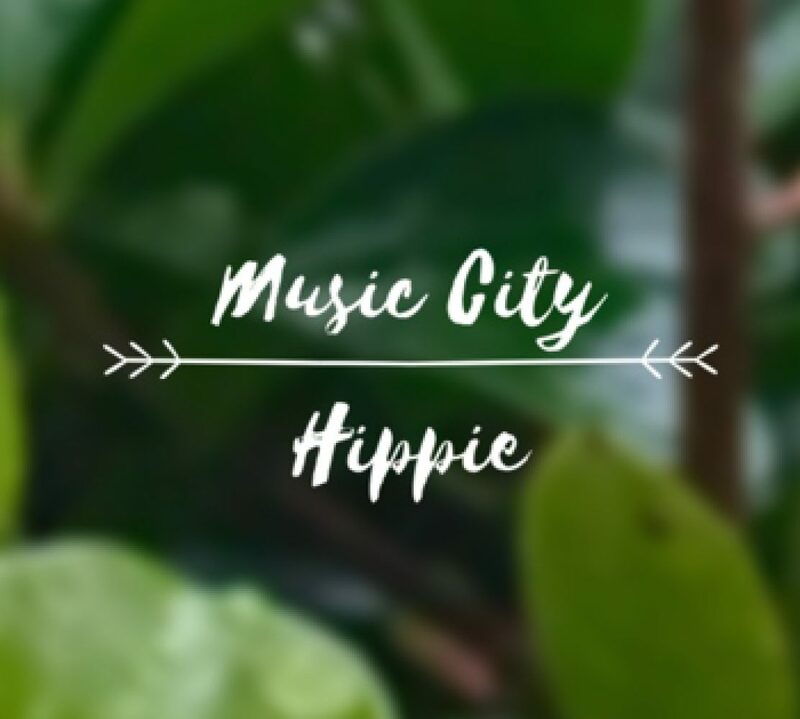 It has a long stalk and is thin and straight all the way to the flower base. On the right is a female squash flower. It is closer to the center of the plant, doesn’t have the long stalk, but more importantly, it has a bulge at the base of the flower. Once pollinated, this bulge is what becomes the squash. 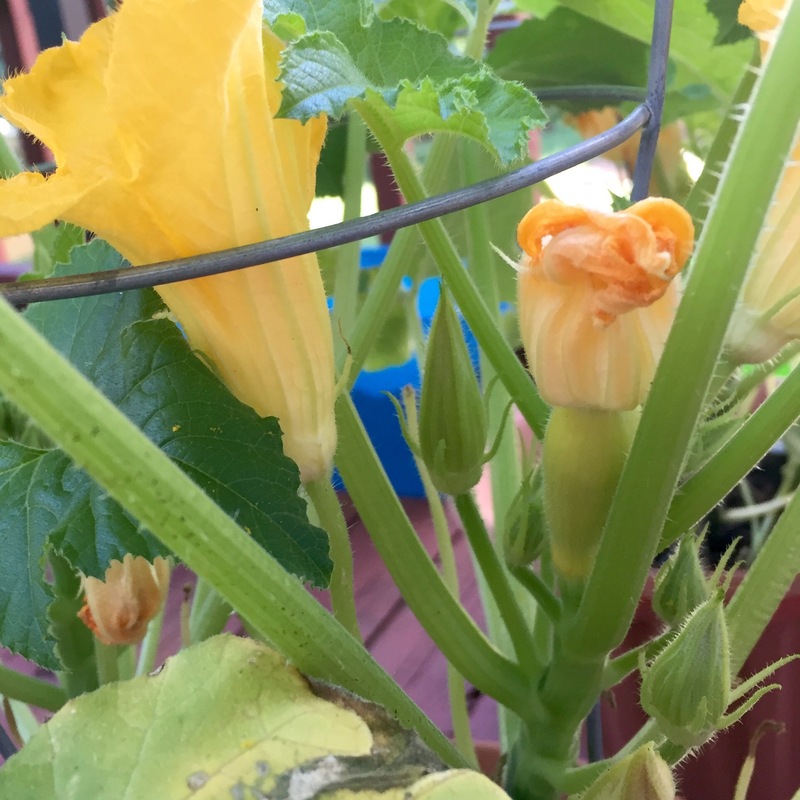 Like males, the females will only bloom for a day and then close up, but they will hang on as the baby squash develops while the males drop off. So, your squash blossoms dropping off the plant is sad, but normal. Don’t worry, a healthy plant will produce lots of blossoms to enjoy through the season. Squash varieties, including zucchini, are easy to grow and usually prolific producers of fruit. The large showy blooms are an added bonus. So, rest easy and know that Mother Nature has this well in hand. 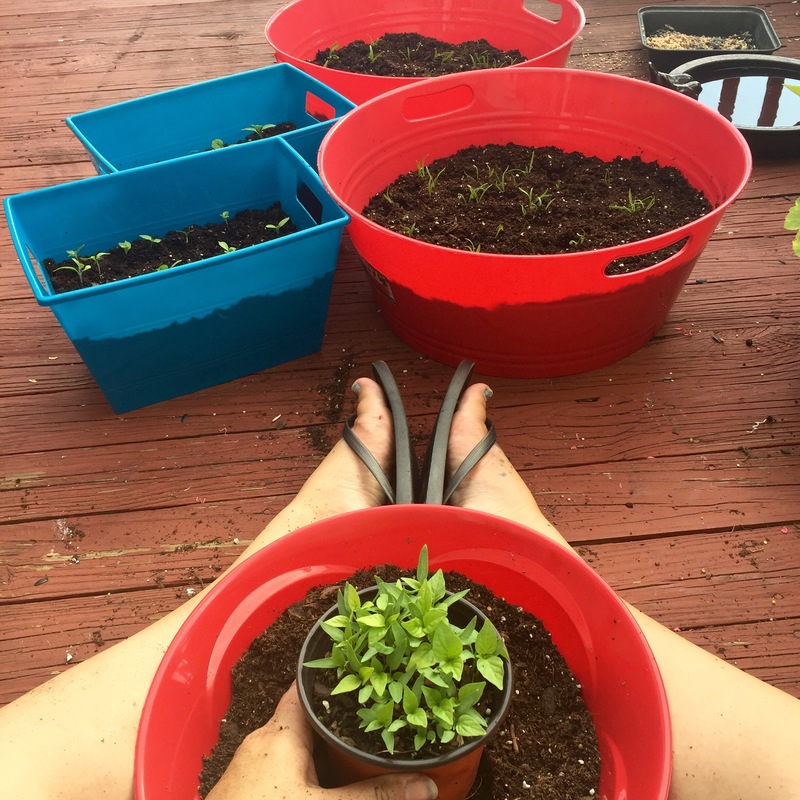 Are there other container garden questions you have had as you start out with your garden? Post them in the comments!